During the time I have been working as a student ambassador for the Great Writers Inspire project, I have, on many occasion, been thwarted at the last moment by the three little words ‘all rights reserved’. After having stumbled across brilliantly evocative images and informative text, an online resources’ lack of Creative Commons license is frustrating to say the least. However, in the process of researching for the Walt Whitman author page of the Great Writer’s website, I have found the fantastic Walt Whitman Archive: www.whitmanarchive.org. Being now slightly more experienced in the complicated realms of copyright law, I went straight to the licensing section of the website, and read the magic words: ‘You are free: To Share-copy, distribute and transmit the work’. I am not ashamed to admit that I found this news incredibly exciting, and started clicking through the website at great speed, my eyes greedily absorbing the content and my mind planning ways in which we could incorporate the resource into our own Whitman section. This is where the online archive steps in, and it definitely succeeds in this respect and beyond, providing a navigable website stuffed with Whitman content, which includes the different editions of Leaves of Grass, poems published in periodicals, correspondence, and contemporary reviews. However, what I find most appealing about the website is the abundance of images it contains. 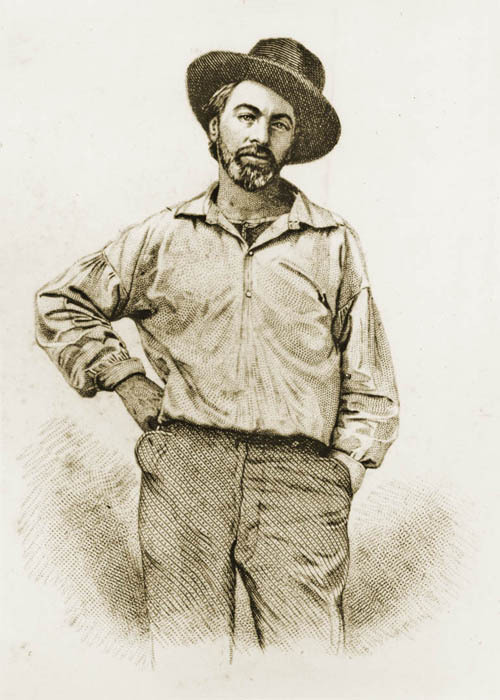 These images show Whitman at various stages throughout his life, both as a young and old man, and each one is accompanied by a detailed note informing the viewer of the story behind its production. For example, we learn that the famous daguerreotype depicting Whitman, open shirted, in workman’s attire and ‘one of the roughs’, he later considered as sending the wrong message, because he looked ‘so damned flamboyant’. Whitman was fascinated with photographic images of himself, and the website’s incorporation of so many varied portraits of the poet really reflects the interest of Whitman himself, and helps us gain a greater insight into the life and works of this famous and inspiring writer. Walt Whitman by Samuel Hollyer, of a daguerreotype by Gabriel Harrison (original lost) New York,July 1854. Image reproduced from the Walt Whitman Archive. Alongside the portraits of the poet, there are also many images of Whitman’s poetic manuscripts and his Civil War notebooks, which describe in detail Whitman’s visits to hospitals, and contain stories collected from soldiers. The inclusion of such visual material complements Whitman’s written work, illustrating the context and creative process behind his poetry, creating an accessible and interesting starting point in which one can begin to study Whitman’s work and its context. 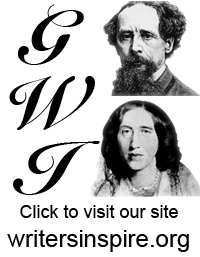 I am very pleased to think that the Great Writer’s website will be an invaluable online scholarly resource, similar to the Whitman archive but even greater in its scope due to the varied authors and themes we will be presenting to students and all those interested in these works that continue to inspire in the 21st century. This entry was posted in resource, writer and tagged Academia, be inspired, Great Writers, poetry, Victorian, Whitman, Writing. Bookmark the permalink. 1 Response to The satisfaction of a reliable and interesting source….